while we were working and some when we were finished. The bushes were all over grown and the weeds were tall. 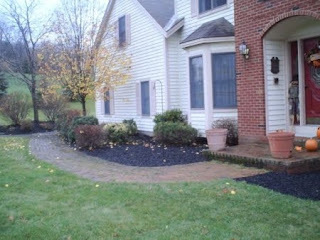 We had to bring in about 12 yards of mulch for the front of this property. We freshened up the edges around the mulch beds and dug out all unwanted plants. Shaped all of the bushes up a bit.